The Rug Continues…and a Shawl! | Knit Like You Mean It. The Rug Continues…and a Shawl! That’s a lot of squares. Seriously, I’m not sure any more what my problem is. The rug still seems ugly. Am I a perfectionist? Entirely possible. 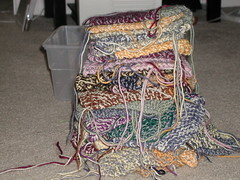 Do I just have a problem completing things (knitting projects, self-improvement plans, writing careers)? Absolutely. Nevertheless, I think it looks weird. I really, really want to do something to make it better. But I’m a little stuck. 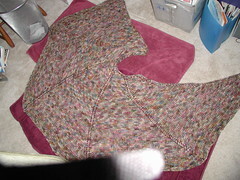 It may be that I should just sew the squares together haphazardly, felt the thing, and see what happens. But once it’s felted there’s no turning back! Ah, the drama. Meanwhile, to prove to myself that I can indeed finish knitting projects, I sewed the ends of my shawl from the winter, and blocked it (OK, way too late to wear it, but still). Ta-da!